Flying has become a necessary mode of transportation for all Americans. Whether it’s for business, visiting family, or vacations, most people head to the airport to reach destinations. Even though there are numerous benefits to flying versus driving a car, there are also several risks that you may not be aware of. One of the biggest risks that people take when flying is getting sick, more specifically catching the flu during the winter months. Most people are under the impression that the air in the plane is what causes the spread of germs; they think the re-purposed air flowing throughout the plane increases the chance of people getting sick. However, this is not the case. People catch the flu because of unclean surfaces inside the airplane. We’re here to help you be healthier and happier the next time you travel. Here are four things you should avoid while on an airplane and four things you can do to help prevent getting the flu while you travel. Because of the high toilet-to-people ratio on an airplane, this means that you are more likely to run into pesky flu germs. Bathrooms inside an airplane are not routinely cleaned as other public bathrooms are, which is why you are more likely to get sick when using them. Most of the time, crew members on a plane do not have time to thoroughly clean bathrooms before a flight, so not only are you dealing with the germs of people on your own flight, but also the germs of those who were previously on the airplane. Try to avoid using the rest room if you can. Make sure you use the restroom at the airport, and remind your family members to do the same. This may not seem as obvious, but there are plenty of germs living on the seat tray in front of you. Studies have shown that influenza and even MRSA have been found on these trays, so it is best to avoid them. This is especially true if you are sitting in an aisle seat. People passing through are more likely to touch these arm rests, spreading even more germs throughout the plane. Because planes are not cleaned before every flight, these germs spend a longer time on the airplane, increasing the likelihood of you or a family member catching them. These are most likely re-used items that the crew does not clean often. The best solution is to avoid the pillows and blankets altogether. If you are on a longer flight, make a point to bring a pillow and blanket with your carry-on so that you are not putting your immune system at risk. This might be something you already do, but it is always a good idea to keep a travel-sized hand sanitizer with you while on a plane. Hand sanitizer that is at least 60 percent alcohol will help rid your hands of any germs that you might have run in to. You can easily find a travel pack of disinfectant wipes for your airplane needs. 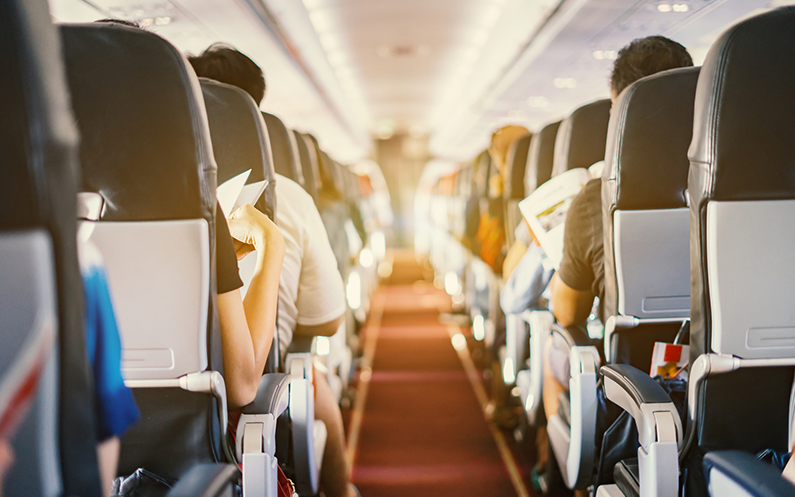 Before you use your arm rest or seat tray, make a point to disinfect these areas with wipes, getting rid of any germs that might still be there. Your eyes, nose and mouth are the main entry points for germs, as your fingers are typically around these areas. By refraining from rubbing your eyes and putting your fingers in your mouth, you won’t be letting germs from the plane enter your system. Germs are easily transferred the magazines in the seat-back in front of you, so it is wise to bring your own source of entertainment. Bring that novel you’ve been waiting to finish, or your computer to watch a movie. We want you to enjoy traveling and not worry about possibly getting sick while away from home. Take steps to make sure that you and your family will be safe from the flu this season. However, if you or a family member does get sick while traveling, feel free to stop in to one of our eight clinics and see a doctor right away. We have locations in Montana, Kentucky, and Colorado where patients can stop in without an appointment and receive quality care.